The Pressroom of the New York Tribune. Frank Leslie's Illustrated Newspaper, July 20, 1861. The Folding and Mailing-room of the New York Tribune. 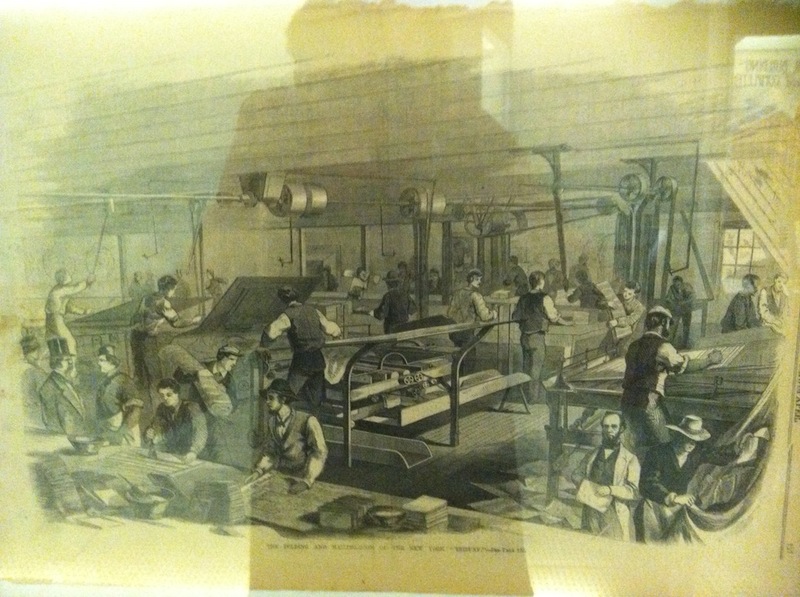 These scenes of the press and folding rooms of the Tribune in 1861 make clear the labor-intensive process of mid-19th century printing. Workers can be seen feeding individual sheets of paper into the press and carrying away printed papers. Type was attached directly to the central cylinder; swapping out type for new pages was time-consuming and laborious. The second image shows the Tribune's folding room. 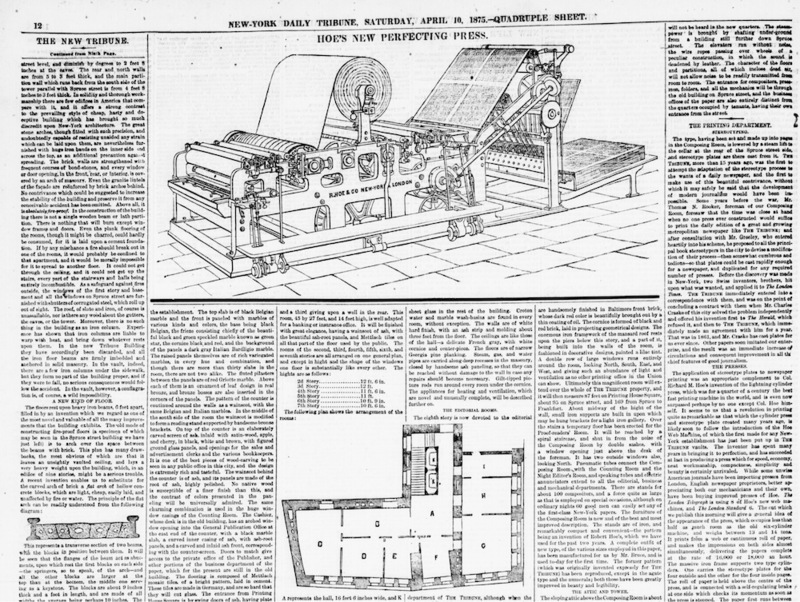 Folding was done manually prior to the invention of mechanical folders in 1876, so a small army of workers was needed to fold the printed sheets into newspapers. While newsboys distributed the bulk of the daily edition of the Tribune, the Weekly Tribune was mailed to its subscribers. As the Tribune noted in its April 10, 1875 edition, the Hoe Web Perfecting Press required only two men to operate it, and enabled the editor to hold all his forms open until about 3 o'clock in the morning, instead of locking up half the paper at midnight. Paper was printed from a web, or roll, and solid printing plates were used in place of individual pieces of type. 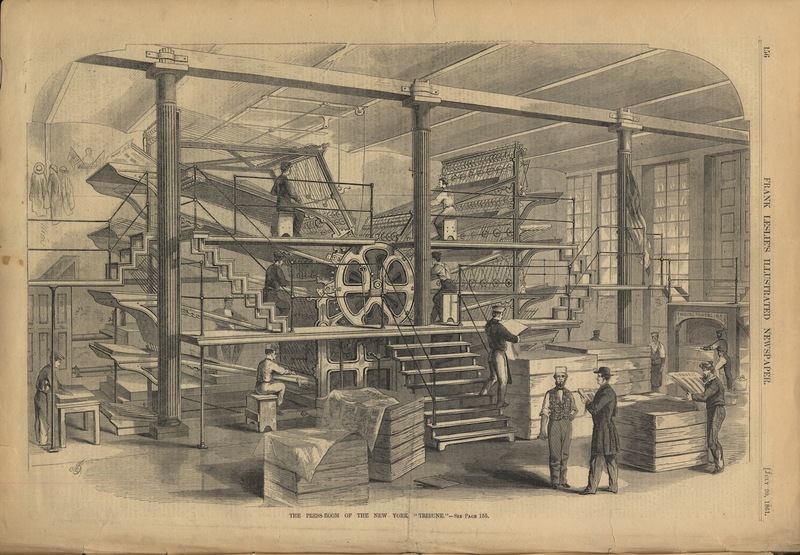 When folders were added a year later, the Web Press could produce eight-page newspapers ready for delivery at a rate of 12,000-14,000 an hour.